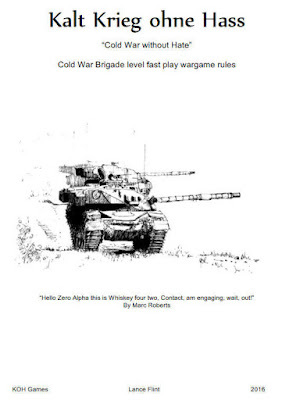 Kalt Krieg Ohne Hass, Fast play wargame rules for Brigade/Regimental level battles of the Cold War era, using 15mm through to 2mm miniatures. A grid based battlefield regulates all firing and movement eliminating any micro-measurement. No record keeping is required. Vehicle scale is one base of miniatures to about 10 vehicles or about 100 men, with a grid square being one square kilometre. Command and control is central to the system without being complicated but having a significant impact upon operations. Included are special rules for air support, minefields, counter battery fire, Electronic warfare and chemical warfare. A Brigade level game can easily be fought through in three hours.